For the National Association of Women Artists (NAWA), the Small Works exhibitions held in the summer and winter have become a treasured tradition among members and non-members alike. From February 6-27, 2019, the works on display at the NAWA Gallery will prove that the size of an artwork does not have to determine its excellence or worth. With a close study, viewers will find remarkable detail and precision at play in several mediums. They will also find a surprising seriousness and boldness of intent often reserved for larger works. NAWA is celebrating its 130th Anniversary in 2019, in honor of the five women who gathered together at the Washington Square home of Grace Fitz-Randolph on a cold night in January to create the first women's art club. Today their talented counterparts continue the mission of supporting public awareness of the visual art created by women throughout the United States. Over 800 professional women artists comprise the national membership. Each year an array of juried exhibitions and awards, numerous workshops, and fundraising events increase NAWA's visibility nationwide. 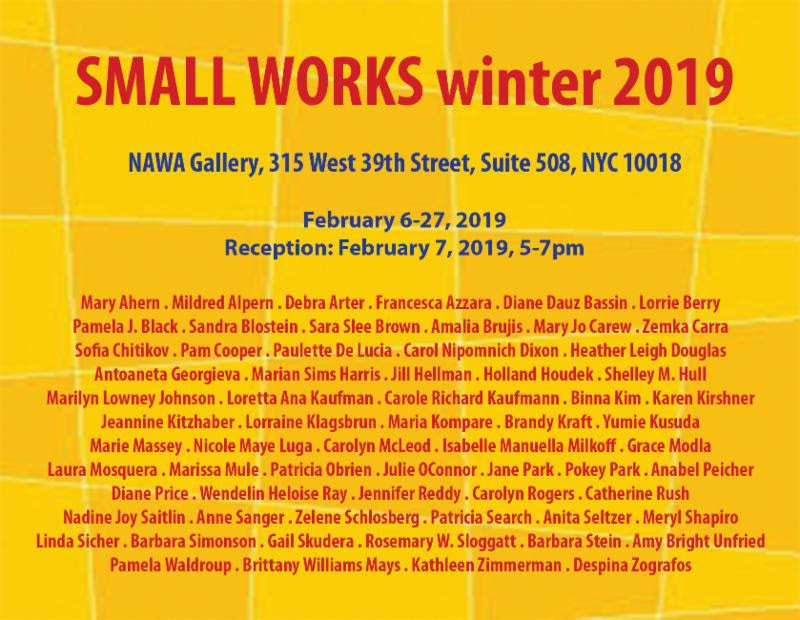 This winter, NAWA invites friends and newcomers alike to come in from the cold to experience the Small Works Winter Show. Thereception on Thursday, February 7, 2019, from 5-7 pm, at the NAWA Gallery, 315 West 39th Street, Suite 508, New York, NY. It will be a rare opportunity to meet the artists and warm up with their bright and innovative works. Participating artists include: Mary Ahern, Mildred Alpern, Debra Arter, Francesca Azzara, Diane Dauz Bassin, Lorrie Berry, Pamela J. Black, Sandra Blostein, Sara Slee Brown, Amalia Brujis, Mary Jo Carew, Zemka Carra, Sofia Chitikov, Pam Cooper, Paulette De Lucia, Carol Nipomnich Dixon, Heather Leigh Douglas, Antoaneta Georgieva, Marian Sims Harris, Jill Hellman, Holland Houdek, Shelley M. Hull, Marilyn Lowney Johnson, Loretta Ana Kaufman, Carole Richard Kaufmann, Binna Kim, Karen Kirshner, Jeannine Kitzhaber, Lorraine Klagsbrun, Maria Kompare, Brandy Kraft, Yumie Kusuda, Marie Massey, Nicole Maye Luga, Carolyn McLeod, Isabelle Manuella Milkoff, Grace Modla, Laura Mosquera, Marissa Mule, Patricia Obrien, Julie OConnor, Jane Park, Pokey Park, Anabel Peicher, Diane Price, Wendelin Heloise Ray, Jennifer Reddy, Carolyn Rogers, Catherine Rush, Nadine Joy Saitlin, Anne Sanger, Zelene Schlosberg, Patricia Search, Anita Seltzer, Meryl Shapiro, Linda Sicher, Barbara Simonson, Gail Skudera, Rosemary W. Sloggatt, Barbara Stein, Amy Bright Unfried, Pamela Waldroup, Brittany Williams Mays, Kathleen Zimmerman and Despina Zografos.